We took a drive up to the Litchfield CT to visit a good friend who now works at the Livingston Ripley Waterfowl Conservancy. All I can say is ‘wow.’ The place is beautiful, pristine and the added vista of the turning leaves made the trip even more special. Swans geese, cranes and ducks as far as the eye can see. It is a not for profit facility dedicated to the conservation and preservation of waterfowl. The Conservancy is open to the public on Fridays and Sundays. A special shout out to Chuck and Ian for making our visit so memorable. If you subscribe to my weekly photos (and get them in your in-box) you are probably not able to view my videos from your inbox image. Just scroll up and click on the Blue link (which is the name of today’s send) and it will take you back to my ‘While at the Zoo’ website where you can watch today’s video selection from the Conservancy. Who’s your cover boy? I don’t recognize the species. He sure is striking! 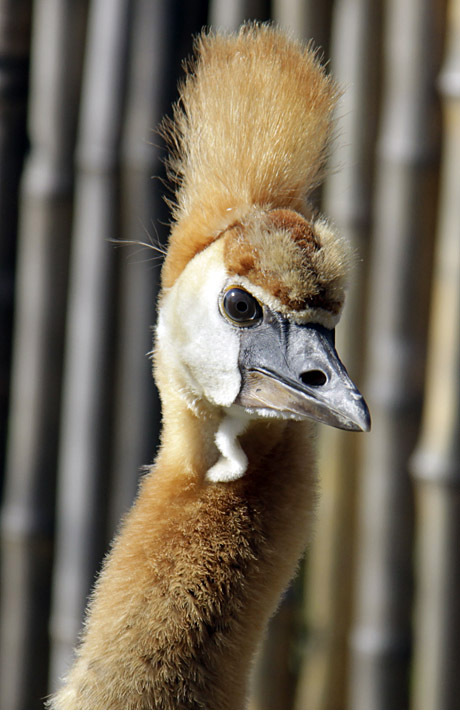 That handsome bird is an East African Crowned Crane juvenile.